George Keremedjiev is an instructor and consultant with Tecknow Education Services, Inc., and has more than 30 years of experience implementing error-proof electronic-sensor systems in tooling, dies, molds and assembly machines; gk@mfgadvice.com. The best and most effective to implement a die-protection program revolves around a groundswell of support from all quarters of a metalforming shop to get the job done, coupled to the enthusiasm of a champion —an individual who mentors, drives and unwaveringly pioneers the program. Such is the case at Manufacturers Industrial Group (MIG), LLC, Athens, TN, a manufacturer of manual seat adjusters, welded assemblies, metal stampings, and fineblanked and wire-formed parts. 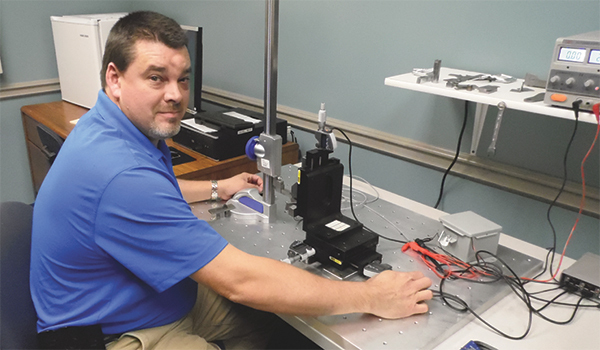 Here we find sensor application specialist Carlos Tilley, a tool and die maker since 1990. Tilley brings to his position critical experiences with tool design, CNC and wire-EDM programming and operation. Over the years, his leadership skills have been honed as a shift leader and apprentice mentor. Sensor application specialist Carlos Tilley feels right at home at his test bench, where he proves out all die-protection setups before bringing them onto the shop floor. To best tap into Tilley’s varied experience, in August 2012 MIG promoted him to tool engineer, and in December 2012 he was tasked with launching, developing and managing the firm’s die-protection program. Tilley has a healthy and positive outlook on his position and the goals of the die-protection program. Fig. 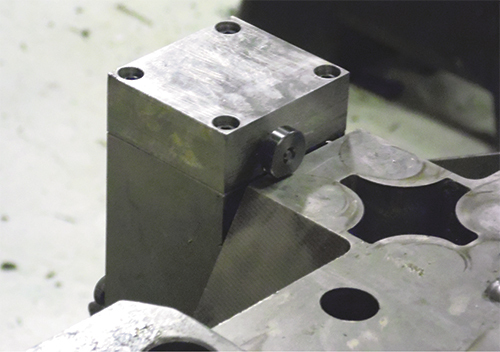 1—This plunger mechanism uses two proximity sensors embedded in a block of steel to detect strip over- and underfeed. Fig. 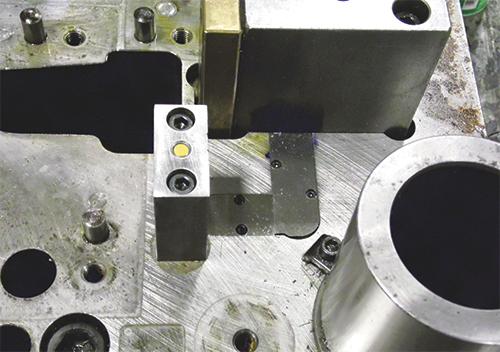 2—Stripper sensors (one shown here) in each corner of a die will detect a poorly closed stripper, indicating foreign material laying on top of the strip or embedded in the stripper. As the saying goes, the proof is in the pudding, and the photographs illustrating this article illustrate MIG’s fusion of sensor development, implementation and utilization. The first such image showcases Tilley’s approach to strip feed (Fig. 1). Within a robust block, he has located two inductive proximity sensors to monitor plunger motion. As the strip arrives at its final position, the plunger is pushed into position against a spring. The two sensors check to ensure that two carefully machined notches are in their respective proper locations, indicating a good feed. Fig. 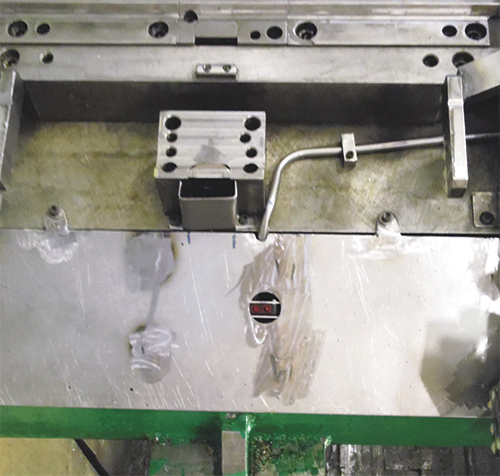 3—Hydraulic tubing protects the wiring of a part-out sensor embedded within the guiding exit plate. As I have described in earlier writings in this magazine, the type of pilots being used in the die determines the tolerance on such a feed. The pilots are meant to navigate (or fine-tune) the final position of the strip before the die fully closes, to perform the various forming, piercing, slitting and other operations. It is crucial that the feed meet the ability of the pilots to do so. So, for example, the feed length can be 10 in.—but plus or minus what? This tolerance can range from a few thousandths of an inch to 50 or more thousandths. Thus, the pitch and its tolerance should be clearly marked on the side of every die. Many stamping shops over- or underfeed strips on a regular basis on some of their tools, not realizing that such errors can easily lead to quality issues as holes are pierced incorrectly, forms are shaped poorly, etc. Scrap or slugs deposited on top of the strip or becoming embedded on the surface of a stripper can cause a phenomenal amount of die damage and quality issues. As the scrap or slug travels with the strip, punches can be sheared, features on the part altered and cosmetic issues developed that may not be caught until the part arrives at the customer’s facility. 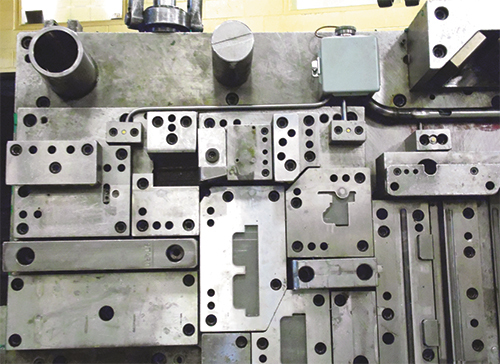 Likewise, a piece of scrap or a slug attached to the stripper can emboss patterns on parts that functionally or cosmetically become rejects with the customer. Fig. 4—Where possible, Tilley routes sensor wiring through channels in the die. A protective screw-on cap shields the connector’s pins from accidental damage while the die moves in and out of the press and while in storage. Tilley also has mastered the detection of slugs and scrap, by placing inductive proximity sensors—one per corner of the stripper—within blocks of steel, with their wiring carefully protected within channels (Fig. 2). When the stripper bottoms out, the four sensors need to be activated. If one or more of the sensors are not, then the die stops at the full open position and the location of the scrap or slug is announced by the die-protection control to the operator for its removal. Likewise, if one or more corners of the stripper arrive sooner than the rest, the sensors then can help to detect spring or nitrogen-cylinder failures behind the stripper. A double whammy of sensing. Part ejection can be extremely tricky, as the parts can fly out of the die at high speeds and, most challenging of all, rotate and spin. This dynamic and fast-moving target can be quite difficult to detect and requires significant test-bench development to ensure there are no blind conditions where the optical sensor fails to detect the part. Likewise, the sensor applications specialist must ensure that the part can be detected regardless of which edge or surface is presented to the sensor. As seen in Fig. 3, Tilley employs a reflective photoelectric sensor to perform part-out detection; note its respective cables protected within hydraulic tubing. Where practical, Tilley has carved channels into MIG’s dies to accommodate the sensor wiring. In many cases, however, this is not economically feasible, so he uses hydraulic tubing to protect the wires. See also: Tecknow Education Services, Inc.